If eating bacon for breakfast, lunch, and dinner isn't enough to satiate your love for rashers, then how about eating it for dessert too? It's what a true baconphiliac would do. 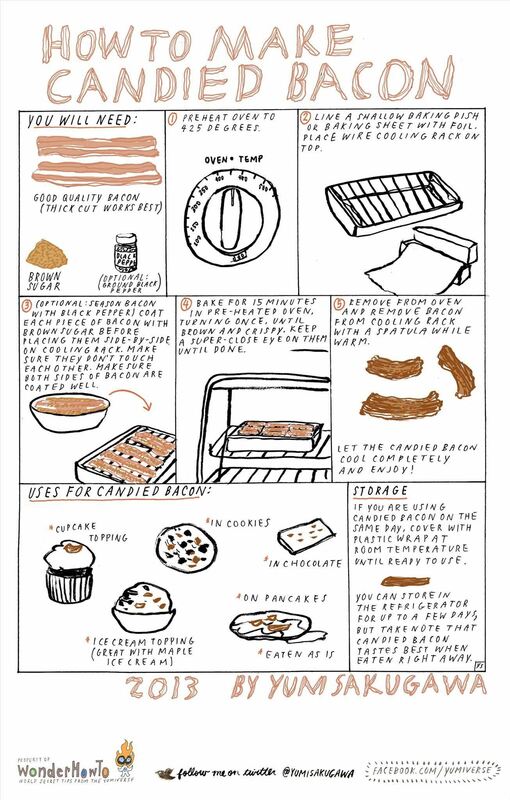 You don't need to go to a gourmet cupcake shop or ice creamery to get your candied bacon fix; it's actually quite easy to prepare on your own. Simply coat thick-cut bacon with brown sugar and a little ground black pepper on both sides, place on a cooling rack on top of a baking pan, and bake for 15 minutes in an oven preheated at 425 degrees. Once the candied bacon is brown, lacquered and crispy, you can eat the candied bacon as is or sprinkle on top of cupcake frosting, ice cream, pancakes, cake, salads, and more. Got your own favorite uses for candied bacon? Share with us.